K-Stereo, Surround Sound/Spatialization Software from Algorithmix. 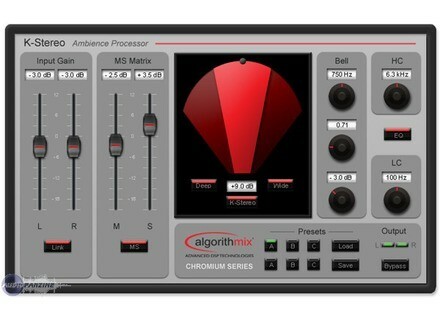 Algorithmix has announced the release of K-Stereo Ambience Processor which they claim is the world's first "Ambience Recovery Processor". K-Stereo Ambience ProcessorK-Stereo Ambience Processor is a VST processor designed for natural and unobtrusive enhancement, expansion, and equalization of the ambience, space, imaging, depth and width in a recording without adding artificial reverberation or causing unwanted coloration or artifacts. K-Stereo is a patented psychoacoustical process (US Pat.7076071) that extracts the ambience inherent in ordinary recordings, and is designed to spread that uncorrelated ambience around the soundstage, and enlarging the size of that soundstage, both deeper and wider. In addition, K-Stereo is supposed to enhance the depth and imaging of the instruments and vocals without adding any artificial reverberation. We're told that it does not have a sound of its own; it fills in what's been missing and that K-Stereo is also capable of making a natural mono to stereo conversion. 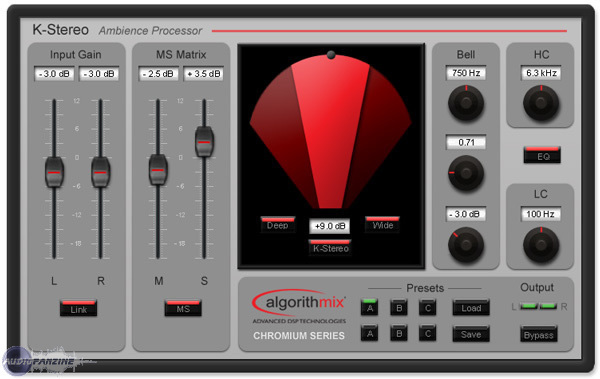 The plug-in is intended to be compatible with the new VST version 3.0 and is the first in the new Algorithmix Chromium Series, a set of reference mastering plug-ins. Natural and unobtrusive enhancement, expansion, and equalization of the ambience in a recording without adding artificial reverberation or causing unwanted coloration and/or artifacts. Improves the definition, depth, width and space of any recording. Enhances the shape, spread, tonality and depth when used in reverb return. Preserves the color and feel of the original reverberation. Compensates for spatial and depth losses associated with wordlength reduction, e.g. 16-bit or mp3. Moves instruments and vocalists that are too far up front—away from the listener. Mono to stereo conversion preserving excellent mono compatibility. Reliable operation with up to 384 kHz sampling frequency, thus perfectly suitable for high-resolution DSD post-production. Extremely low noise and low nonlinear distortion algorithm implementation resulting in the residual THD+N significantly lower than 24-bit quantization noise. All internal calculations are in double floating-point accuracy (80 bits). Low CPU usage allowing many instances to be opened simultaneously. Exact parameter editing via numerical fields. Three fast accessible presets for quick setup comparison. Complete setup exchange among several simultaneously opened instances. Priced at €790, K-Stereo is available now for Windows as a VST effect plug-in (including VST3 support). A demo version is available. McDSP ships Emerald Pack 3.0 McDSP has released Emerald Pack 3.0 (HD and Native) to include the new DE555 De-esser, FutzBox Lo-Fi Distortion Effects, and NF575 Noise Filter plug-ins. Ueberschall releases Score FX Ueberschall has announced the release of Score FX. a new Liquid Player-based sample library. KResearch releases KR-Space v1.5 KResearch has announced that it has updated KR-Space to v1.5 which is a rather major reworking of the "modular reverb-echoes based multi-effect plug-in" for Windows and Mac OS X.